Last year a friend asked me if I was going to see the kissing festival. I just gave a smile as if to say, you have to be smarter than that if you think you’re going to fool me. I honestly thought she was pulling my leg and gave it no further thought. This year she asked the same question and I thought, Wow! you really go to some lengths for your practical jokes. She once again tried to convince me that she was not lying. I asked my maid if she knew anything about it and she just gave me the same perplexed look as the maid I had last year. Still I decided to go to Denpasar, the capital of Bali with my friend after saying that if she was lying she wouldn’t be getting a ride home. Public kissing in many parts of Asia is unheard of. I don’t ever recall seeing couples kiss on the street and as I have spent most of this decade in Asia, when I make the occasional trip back to the UK, I am often taken aback seeing couples smooching, and only stop gawking when I remember that there are things like traffic and lamp posts to avoid. As we arrived in the area there were large crowds of people. The main road was closed and full of stalls and there was a band playing on a stage. I pushed my way to the front with lots of excuse mes, until I reached the part where the crowd was partitioned by patrolling men armed with hosepipes. They were dousing the crowds with water, partly to keep the crowds back and partly for their own amusement. With my camera in hand, all I was thinking was that after today I might be in need of an upgrade. Luckily, being the highly trained professional that I am, my bag contains all the essential hi-tech gizmos. A 500ml bottle of water for thirst, the camera manual because I still don’t know how to use it, and a small towel for Balinese hosepipe men. I moved the towel to the top of the bag and stared menacingly at the hosepipe men as if to say, I have an anti hosepipe, camera loving gizmo and I fear you not, well not much. The band stopped playing, little kids and their mothers stopped moshing and rows of teenage girls and boys came from… well I don’t know where exactly, to take their positions in the cleared space between the crowds, about 100 metres from each other. Hosepipe men were working extra hard now to ensure that there was a clear path between the girls and the boys. I was in the middle with a few other well prepared photographers, who sported even more sophisticated equipment, plastic bags seemingly cellotaped to their cameras. I was impressed. Then some of the hosepipe men started to wave to hosepipe men at the opposite side. Suddenly the girls and boys from both ends started running towards each other, I started taking photos of them running and then they ran past me, I tried to follow but there were already too many people in front of me. I could see other photographers snapping away closer to the action, but I couldn’t see what was going on. This happened quite a few times with each time me being in the wrong place. 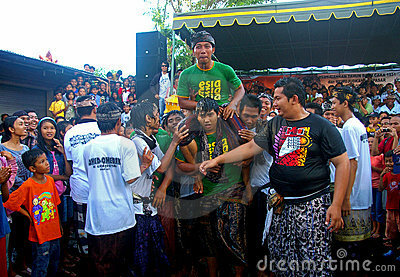 Then there was a change of tactics, girls and boys were now being lifted (some reluctantly) on the shoulders of the strongest Balinese men on the island, now these men were doing the running with the crowds following behind. Again I was in the wrong place. I felt that I could move to the place where most of the action seemed to be happening, but for some reason I liked being where I was. I had been photographing non stop, for more than an hour now and really enjoying myself, my adrenalin was pumping hard, my towel was now around my neck as my camera was in constant need of it. At one point I reached for it and it wasn’t there, I looked behind me in the vain hope that it might be there and to my amazement it was, a smiling Balinese boy was standing right there holding my towel. I was so happy to have it back, I almost hugged the guy, must have been the occasion. As you can imagine I was very appreciative, as I simply could not continue photographing without the towel. Finally right towards the end of the proceedings, a girl was lifted on the shoulders of a Balinese strongman quite close to me and the boy at the opposite end was called over. This could be it, maybe I could get a good look at what was going on. The boy past me with hundreds of people behind him, I followed. Although he had only just passed, there were already so many people in front of me, but I was closer than I had ever been and managed to push my way a little closer. Then I saw the couple both perched upon shoulders high above the crowd, they embraced, from this point on all shots were taken with my camera lifted way above my head. I tried to adjust my positioning the best I could. Then they kissed. Two complete strangers who have never even spoken to each other, kissing passionately with thousands of people around them. I was really hoping that I was getting some good shots. Luckily they kept on kissing. From the ooohs and the arghs of the crowd, I knew this was the kiss of the day. It was a really long kiss. I started to smile, thinking what an astonishing site this was. An openly accepted, publicly displayed kiss in Asia. They only stopped when a man came over and tipped a bucket of water on their heads. After it was over, naturally I looked to see what I got. Although I took quite a few shots, I only got one clear shot of the kiss, but as the Aussies say, “It’s a beauty”. I sent the photos to Dreamstime and a few to Bigstockphoto. I was quite reluctant to send the photo of the kiss as I like it so much, but I decided to send it just to Dreamstime to complete the story. They rejected the image for poor lighting etc., they were not wrong. But as I re-photoshopped the image, I decided not to send it back to them, instead putting it on another site for a much higher price. I first picked up an SLR when I was 15. More recently I left photography for quite a few years, only getting back into it in late 2006. I realised again today how much I enjoyed taking photographs. With my camera in hand I have a perfect excuse to observe people and try and capture their feelings and unique expressions, to record moments in time, to get involved in events. Would I have been following the boys and girls rushing towards each other if I did not have a camera in my hand, probably not.